Cat's Best Smart Pellets is ideal for cats with long fur, as the pellets don't stick to the fur or paws thanks to the smooth surface. 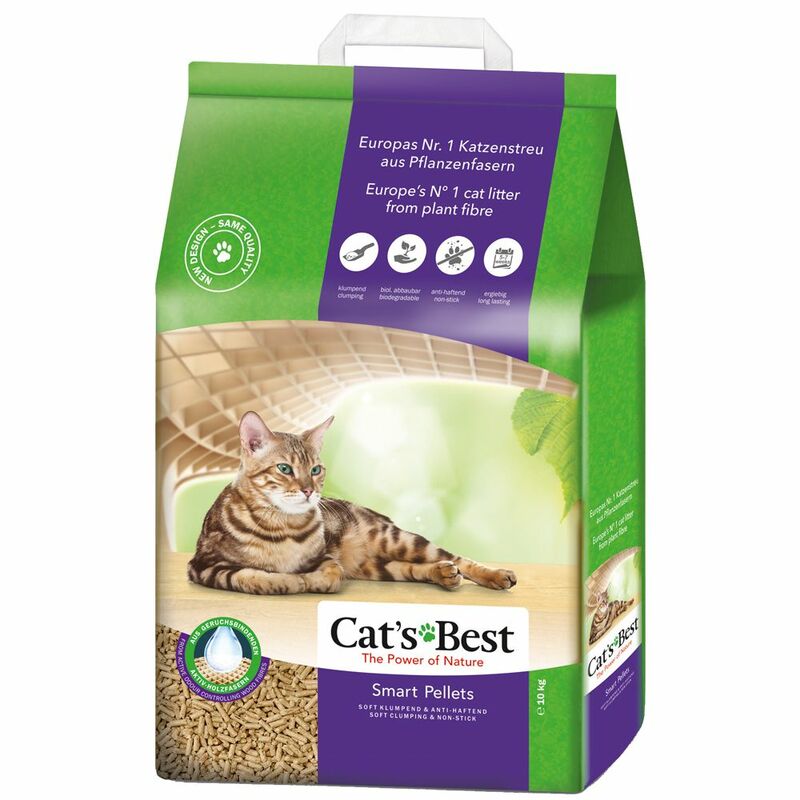 Cat's Best Smart Pellets is a soft-clumping litter made of 100% natural plant fibres, and it is both biodegradable and compostable. Thanks to the odour absorbent active wood fibre technology in Cat's Best Smart Pellets, odours and moisture can be kept bound for a long time. It forms into partiuclarly soft clumps, which can then be easily removed, with the rest of the litter staying in the tray for longer. This makes Cat's Best Smart Pellets more economical than other litter. The main body of litter will last for up to 7 weeks. Cat's Best Smart Pellets work best if you simply remove the clumps that have formed and dispose of them in your organic waste or your toilet. It has been made exclusively with PEFC-certified secondary wood materials from the wood working industry in harmony with nature - no tree is felled! Cat's Best Smart Pellets at a glance: Soft-clumping cat litter made from pellets Anti-sticking: ideal for long-haired cats, thanks to the smooth surface of the pellets that minimises litter being strewn around 100% natural active wood fibres: straight from nature Extremely odour binding: naturally fragrant - no artificial additives (pure natural product) Can absorb up to 7 times its volume in moisture: first-claΒ absorption for dry paws and optimum binding Very economical: lasts up to 7 weeks, more economical than regular litter 100% compostable and biodegradable: waste litter can simply be put in the compost, with clumps able to be flushed down the toilet or put in organic waste Sustainable PEFC-certified: the wood fibres come from secondary materials and ensure no trees are felled Easier to transport - up to 40% lighter than mineral litter Disposal instructions: Clumps should be deposited in the toilet one by one and given plenty of time to individually diΒolve before flushing. Disposal can be made even easier by lightly crushing clumps with a litter scoop to make them smaller. Only one clump should be deposited in the toilet at a time. Allowing the water to fully diΒolve the clumps will ensure that the proceΒ is simple, clean and hygienic. Using the household toilet is not recommended for the disposal of an entire tray of cat litter. In this case, please refer to your local waste disposal regulations - organic waste, compost or normal household waste!.